Next to the new emojis, this Android update also brings various security patches and performance tweaks, counting as December's security update. Strange enough, Nexus devices were not the first ones to receive Android 6.0.1 Marshmallow. However, the Android One handsets that were the first ones to get Android 6.0.1 are still devices very close to Google's inner circle. Now, the time has come for the Nexus slates and handsets to get this update as well. 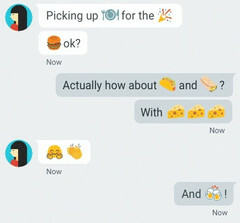 There also seems to be a reason for Google to deliver Android 6.0.1 to other devices before the Nexus family - Cherry Mobile Android G1 did not get the new emojis, apparently. As part of the Android 6.0.1 Marshmallow update for Nexus devices, Google delivered a very rich set of new emojis, as well as various security patches and performance tweaks. For now, the official sources only mentioned the emojis, but since this update counts as the security update for December as well, there has to be something more to it. The update is already available for the Nexus 5, Nexus 5X, Nexus 6, Nexus 6P, Nexus Player, Nexus 7 (2013), and Nexus 9.